Compelling graphics and images can significantly enhance your site. However, they can cause problems if they are too large. Large images can cause delays in opening, uploading, saving, previewing, publishing and viewing your site. This will be a source of frustration to you and your site visitors. Web-friendly images should be between 20KB and 100KB each, depending on how many you have on a page. You can see the file size displayed below the preview of the image in your File Manager. 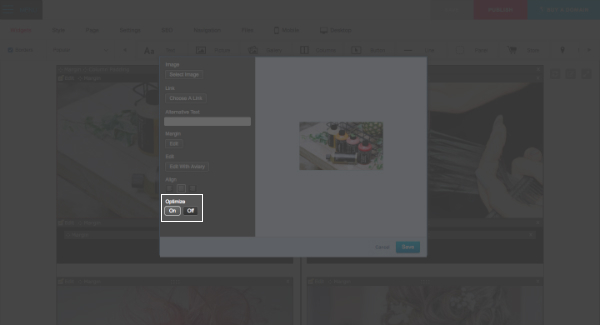 When the image is added to the page, there is a toggle button that allows you to turn the Optimizer On or Off. If your image is already uploaded, and you want to edit it, you can locate the toggle by clicking Edit on your Picture widget. The toggle button is located at the bottom of the dialog box. Optimize On means image optimization is turned on for the image and the image will now load faster on your page. If the button is set to Off then your original sized image is displayed on the page. If the image displayed is too large on the page, you can simply drag and resize the image to your preference. You can add the image to the page using a Picture widget and turn optimizer Off. You do this by clicking Edit on the Picture widget and selecting the Off button under Optimize.